When it comes to your car, one of the easiest ways to get it messy, or possibly ruined, is from your dog. Your innocent, best friend can wreak havoc on your car’s interior. Their nails can easily cause unsightly scratches all over leather seats. They can even puncture and make tears within the leather as well. Beyond that you have to worry about dirt, mud, water, and even fur. If your dog sheds, they can leave fur everywhere which might have some sharp bristles which can make its way into the seat material. So what’s the best way to protect your car’s seats? The cheap and ineffective route is to throw a towel over your seats. Unfortunately your dog will likely just move, shuffle, and rearrange that towel into a nice little pile to sit on. Grooming your dog consistently can definitely help, however this isn’t a foolproof method to keeping your leather seats safe. Even the best nail filing, brushing, and washing still might not be enough to completely protect your seats. 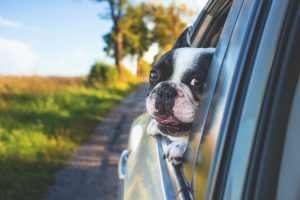 One of the best and easiest ways to protect your leather car seats from your dog’s paws is to purchase and install a car seat cover. There are a number of car seat covers available for purchase but not all are created equal. The type of cover you need will not only protect your car’s seats from claws but also from anything like dirt, water, or accidents. At Wet Okole, we make the perfect car seat cover for pets. Our car seat covers are made from neoprene, the same material used in wet suits, making them ideal for traveling in the rain or shine. The durable material will also protect your car’s leather seats from any scratching your dog might do when jumping in and sitting down. They are also extremely easy to clean, so feel free to let your dog run in the mud! In addition we offer a deodorizer for our car seat covers to help you get rid of that wet dog smell.